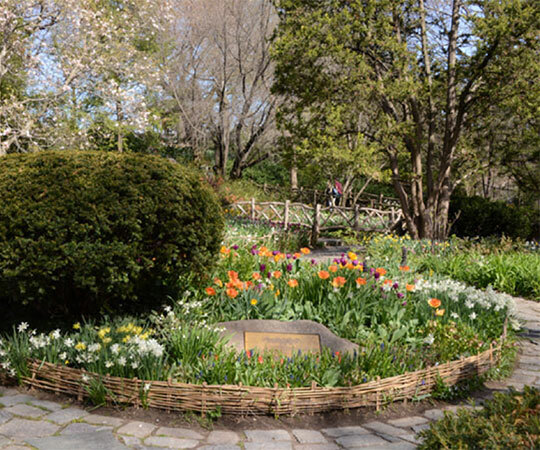 Tucked away on the west side of Central Park between 79th and 80th Streets is Shakespeare Garden. Named for poet and playwright William Shakespeare, the Garden is designed to evoke the Bard’s native English countryside. Featuring hundreds of plants mentioned in Shakespeare’s works, this four-acre landscape surprises and delights visitors each season. Dedicated on April 23, 1916, the tricentennial of Shakespeare’s death, Shakespeare Garden was originally conceived as a place for children to learn about nature. Former NYC Parks Commissioner Charles B. Stover initiated the idea for the Garden, which was brought to life by Dr. Edmond Bronk Southwick, an entomologist with an office in the adjacent Swedish Cottage. Dr. Southwick transformed this rocky terrain — just southwest of the Great Lawn — into a thriving, beloved garden. Over the years, care for the Garden shifted to various groups and NYC Parks. In the late 1980s, the Conservancy restored the Garden, extending it to nearby Belvedere Castle, adding meandering paths and constructing and installing rustic benches and railings. Shakespeare Garden is now home to hundreds of flowers, bushes, and trees that attract butterflies, hummingbirds, bees, and other wildlife. 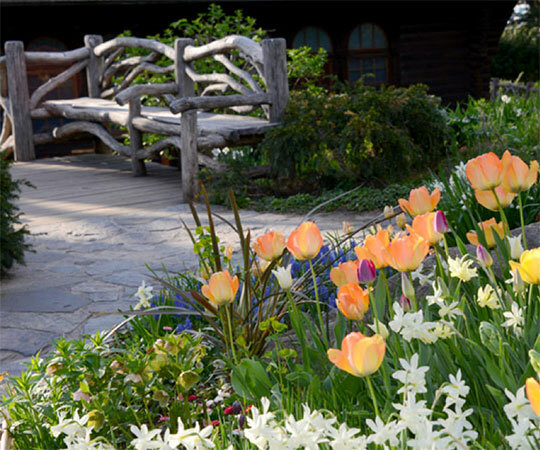 The Garden has become an early spring destination because of its ever-expanding collection of “minor bulbs.” Though these plants are mostly miniature, they are planted in large quantities to provide sheets of color. In addition to beautiful blooms, there are various views and spots in the Garden that even lifelong visitors can appreciate. Did you know the Garden features a working sundial and a curved bench with a special feature that makes it perfect for a date? Don’t miss these unique attractions. 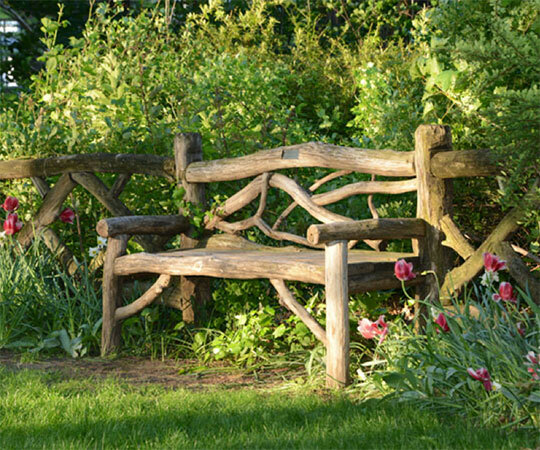 The Charles B. Stover Bench, also known as the Whisper Bench, is perfect for a moment of reflection and sweeping views of the Garden. This curved bench gets its nickname from this fun trick: whisper into one corner of the bench, and the sound of your voice will travel to the other side for only one other person to hear. It’s on one of the most elevated parts of the Garden, and from here, you can also see the Delacorte Theater, the summer home to the Public Theater’s Shakespeare in the Park. Are you a movie or theater buff? 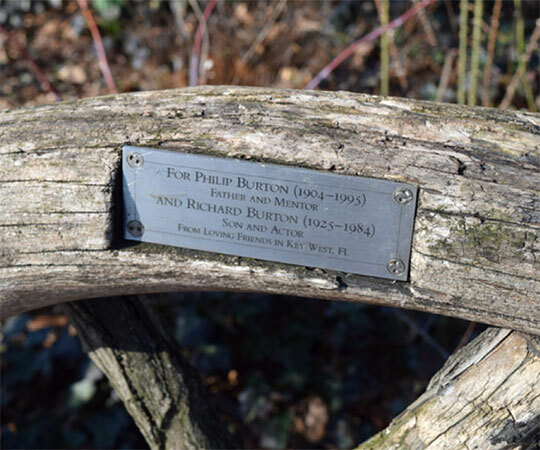 Look for the rustic bench with a plaque dedicated to Richard Burton, a Shakespearean actor who portrayed Hamlet on Broadway in 1964, and Philip Burton, a theater director and Richard’s guardian and mentor. It’s on the east side of the Garden, just steps from Belvedere Castle. As you explore, look for 10 small bronze plaques that feature Shakespearean quotes referencing horticulture. Can you find them all? Keep an eye out for the Garden’s bronze and cast stone sundial as well. Dedicated in 1945, it does work — but don’t forget that it’s set to standard, not daylight savings, time! No matter when you stop by, you’re bound to find something new — Conservancy gardener Larry Boes explains that the Garden has many regulars who visit frequently, even daily. “It’s a small-scale garden and I like the challenge of making it different every year so people want to come back,” he says. Visiting with kids? Download our free Discovery Journal for Shakespeare Garden. If you want to explore the Garden from home, watch our Facebook Live video showcasing the Garden’s colorful blooms last spring.